Support Stars 4 Scars — Shining S.C.A.R.S. Stars 4 Scars delivering copies of the joyful and inspiring tale of little Eugene who realizes his scar helps him to shine brighter than before. You can help Shining Scars mission to make sure all children learn a positive self image that starts from the inside out. Your donation will help me to fill hospital rooms, burn centers, and Children's Miracle Network Hospital's across the United States and beyond, by providing a special child with a copy of my award winning book Shining Scars. Your company or family donation, will help ensure that all children can see the strength of their scars, and always learn to Shine Bright, just like my sweet little star, Eugene! If you are interested in donating to my non profit Shining S.C.A.R.S. Inc., a 501(c)3, please contact me at shiningscars@gmail.com, or simply click the Donate Now button. With your help we can make sure all children understand they are more than the scars they bear. Life has its challenges, but learning to love yourself, flaws and all should never be one of them. Join us and donate today and be part of our mission to ensure ALL children learn at an early age to Shine Bright! Shining Scars receives request from all over the world! 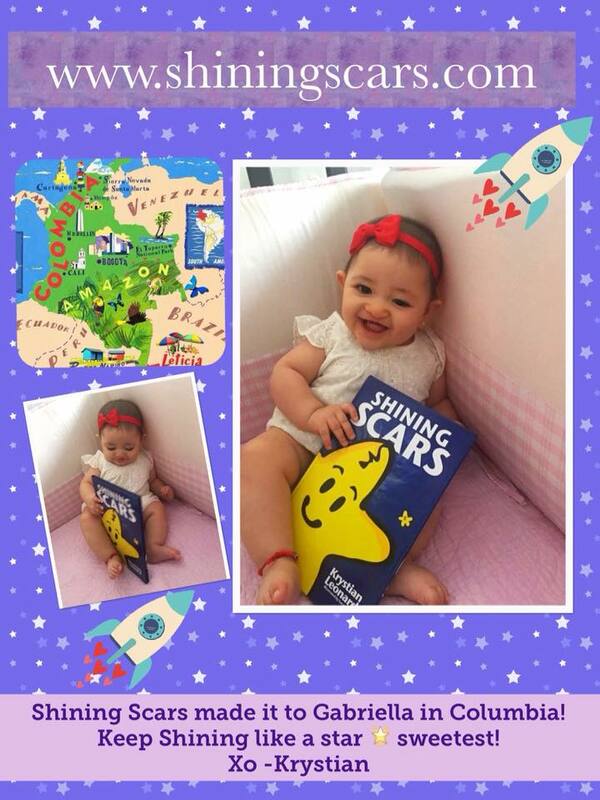 Join us today as we send copies of Shining Scars to children just like Gabriella in Columbia.